Mucin isolated from an ovarian cyst fluid (pure endocervical type according to the Fenoglio's classification) (Human). The epitope is destroyed by beta-mercaptoethanol. Our Abpromise guarantee covers the use of ab24070 in the following tested applications. WB Use at an assay dependent concentration. Predicted molecular weight: 130 kDa. Overlay histogram showing A549 cells stained with ab24070 (red line). The cells were fixed with 80% methanol (5 min) and then permeabilized with 0.1% PBS-Tween for 20 min. The cells were then incubated in 1x PBS / 10% normal goat serum / 0.3M glycine to block non-specific protein-protein interactions. The cells were then incubated with the antibody (ab24070, 1µg/1x106 cells) for 30 min at 22ºC. The secondary antibody used was DyLight® 488 goat anti-mouse IgG (H+L) (ab96879) at 1/500 dilution for 30 min at 22ºC. Isotype control antibody (black line) was mouse IgG1 [ICIGG1] (ab91353, 2µg/1x106 cells) used under the same conditions. Acquisition of >5,000 events was performed. Publishing research using ab24070? Please let us know so that we can cite the reference in this datasheet. I’ve recently used anti-mucin 5AC (ab24070), mouse monoclonal to IgA (ab106706), and an anti-mucin 7 antibody on three separate blots, each containing the same samples; all three appear to be producing the same blotting patterns when used with different antibodies. Does this result suggest that perhaps the primary antibody concentration is too high? The primary concentration in buffer for each antibody was 2ug/ml while the rabbit anti-mouse IgG (ab97046) secondary dilution in buffer was 1:2000. No primary control showed same staining. Thank you for your phone call. I did some research regarding PVA and found that for unknown reasons, PVA does not seem to effectively block background in WB. You may need to switch to BSA or milk in order to get clear bands in addition to the new secondary I am sending. As requested, I have issued a free of charge replacement with the order number 1203530. Regarding ab24070, the datasheet does indicate that B mercaptoethanol destroys the epitope, so you will need to be careful to avoid this reagent when blotting for Mucin 5AC. I’ve recently used anti-mucin 5AC (ab24070), mouse monoclonal to IgA (ab106706), and an anti-mucin 7 antibody on three separate blots, each containing the same samples; all three appear to be producing the same blotting patterns when used with different antibodies. Does this result suggest that perhaps the primary antibody concentration is too high? The primary concentration in buffer for each antibody was 2ug/ml while the rabbit anti-mouse IgG (ab97046) secondary dilution in buffer was 1:2000. I’ve attached three blots labeled with the primary used. Thank you for your time. Thank you for contacting us. Looking at your blots I think there is a few things you can try. One is to decrease the secondary antibody dilution. Since the blots are all the same it indicates some nonspecific binding. You can also add a no primary control to see if there is non-sepcific binding from the secondary alone. You can also increase your blocking time (even overnight at 4 degrees) or switch your blocking agent from milk to BSA or vice versa to see if this reduces background. Normally the primary antibody dilution for a WB when using a purified antibody can be about 1 ug/ml, however since the pattern is the same for all three different antibodies I am not convinced this is a primary antibody problem. Please let me know if these suggestions don't improve your results. Are there any WB images available? Thank you for your call yesterday and for your patience while I have been in touch with the lab. I've attached an article in which both of these Mucin 5AC antibodies were tested in Western blot. Please see page 191 for the images. I hope this information will be useful, but if you have any further questions please let me know and I'll be happy to help. sequence to which this antibody binds? The immunogen used to produce ab24070 is Mucin isolated from human ovarian cyst fluid (pure endocervical type according to the Fenoglio's classification). The epitope ab24070 reacts with has not been mapped so unfortunately there are no further details available regarding the sequence specificity of this antibody. 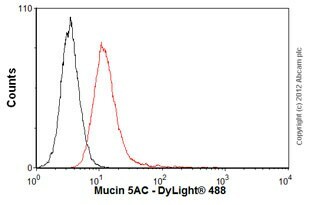 Hi, I am emailing in regards to MUCIN antibody MUC5AC (ab24070). Briefly, we aliquot contents upon arrival into 100ul aliquots and store at -20c. We use at 1:100 (in 1% BSA in PBS 0.05% Tween 20) concentration in ELISA assay. Our order P.O.# *** ordered 5/27/2011. Okey, let me know if you need any further information. Thanks! Thanks for sending the additional protocol information. I am sending a replacement free of charge vial of ab24070 on the order ***, which should arrive tomorrow. Please keep me updated on the stability of this antibody, and let me know if there is anything else I can help with. Thanks for your call today and for sending the information. I agree that the aliquot from August is not working nearly as well as expected. Could you also send a brief overview of your protocol and the storage conditions, for our documentation of the problem? Do you have your order number? I would be happy to send a replacement vial to you if you would like. Please let me know if you have any questions. I look forward to hearing from you. What is the expiration date for ab24070? Thank you for contacting us. We recommend storing this antibody at -20°C or -80°C long-term. This antibody will be viable for at least a year when frozen, but repeated freezing and thawing may damage the antibody. Frost-free freezers prevent the build up of frost by cycling between freezing and thawing. Frosted freezers are highly recommended for the storage of antibodies. I hope this helps, please let me know if you need any additional information or assistance. Thank you for your enquiry. Following correspondence with the lab I can tell you that intestine and stomach were used as positive controls for the testing of this antibody. If you have any additional questions please let me know. On the datasheet it states: "Immunochemistry on paraffin section: very strong positive reaction with ethanol fixed tissues. On formalin postfixed tissues, a protease pretreatment is recommended." Should the information on ethanol-fixed tissues and post-fixed tissues be under Frozen sections? If not, what is meant by "post-fixed" in the context of formalin-fixed paraffin-embedded sections? Thank you for your enquiry. The originator of the antibody stated the following: Ethanol Fixed tissues are imbedded into paraffin in some countries. But I understand that the datasheet is unclear. We will delete the ethanol fixation with paraffin from our information. For paraffin sections: Protease pretreatment is recommended. If you have any additional questions or remarks, please do not hesitate to contact us immediately. Thank you for getting back to me. We currently stock several human intestine and stomach lysates. For example: ab29276 Small Intestine (Human) Whole Cell Lysate - adult normal tissue and; ab29681 Stomach (Human) Whole Cell Lysate - adult normal tissue For further information I would advise you search using the terms "Intestine" and "Stomach". I hope this information helps, please do not hesitate to contact us if you need any more advice or information.